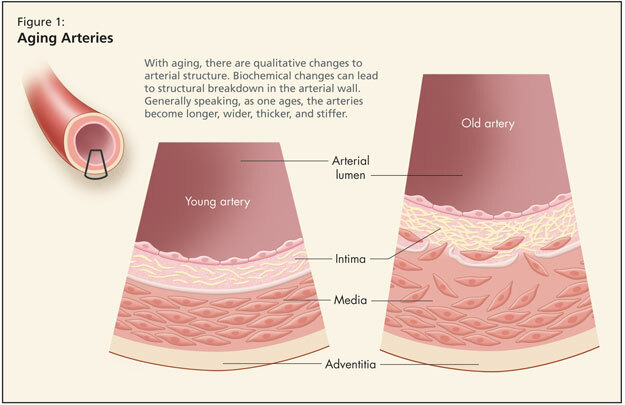 Structural changes with aging involve the myocardium, the cardiac conduction system, and the endocardium. 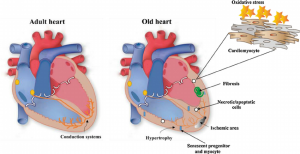 There is a progressive degeneration of the cardiac structures with aging, including a loss of elasticity, fibrotic changes in the valves of the heart, and infiltration with amyloid.The age-associated structural characteristics that have the greatest impact involve the contractility of the heart's left ventricular wall. The pumping capacity of the heart is reduced with age due to a variety of changes affecting the structure and function of the heart muscle. For decades, it was thought that the heart undergoes atrophy with advancing age, but evidence suggests that an age-related increase in the left ventricular posterior wall thickness of approximately 25% has been found between the second and the seventh decade. 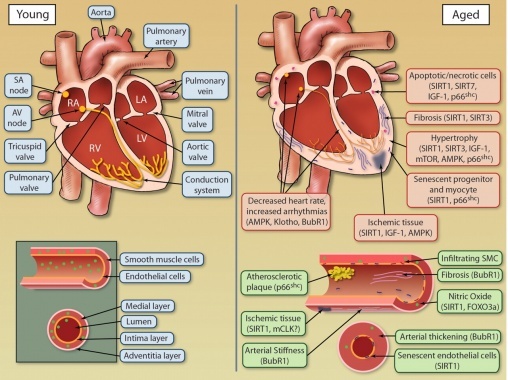 An increase in heart mass with aging, for the most part, is due to an increase in the average myocyte size, whereas the number of myocardial cells declines. Calcific deposits frequently are present  on one or more aortic valve cusps. These changes do not usually cause significant dysfunction, although in some older adults, severe aortic valvular stenosis and mitral valvular insufficiency are related to degenerative changes with age. Clinical heart murmurs are detected more frequently. The nucleus, containing DNA, becomes larger and may show invagination of its membrane.The mitochondria show alterations in size, shape, cristal pattern, and matrix density, which reduce their functional surface.The cytoplasm is marked by fatty infiltration or degeneration, vacuole formation, and a progressive accumulation of pigments such as lipofuscin. The combined age-related changes in the subcellular compartments of the cells result in decreased cellular activities such as altered homeostasis, protein synthesis, and degradation rates. Again, the decline in left ventricular compliance provides an increase work load on the atria, resulting in hypertrophy of the atria. in aging include increased collagen, reduced elastin, and calcification. One important set of changes involves the aorta,the wall of the aorta becomes less flexible, or shows an increase in wall stiffness, so that the blood leaving the left ventricle of the heart is faced by more resistance and cannot travel as far into the arteries.Age-associated changes also occur in the more peripheral vessels the walls of the arteries throughout the body become thicker so that they, too, are less flexible and stiffer.The walls of veins may become thicker with age because of an increase in connective tissue and calcium deposits. The valves also tend to become stiff and incompetent. Varicose veins develop. Because of low blood pressure in veins, these changes probably are not significant for cardiovascular function. They may be of concern because of the possibility of phlebitis and thrombus formation. First, cardiac conduction is affected by the decrease in the number of pacemaker cells in the sinoatrial node with age.Beginning by age 60 there is a pronounced "falling out:' or decrease, in the number of pacemaker cells in the sinoatrial node, and by age 75 less than 10% of the cell number found in the young adult remains.With advancing age, there is an increase in elastic and collagenous tissue in all parts of the conduction system. Fat accumulates around the sinoatrial node, sometimes producing a partial or complete separation of the node from the atrial musculature.The conduction time from the bundle of His to the ventricle is not altered. There is a leftward shift of the QRS axis with advancing age, perhaps reflecting a variable degree of fibrosis in the anterior fascicle of the left bundle branch as well as mild left ventricular hypertrophy. The S-T segment becomes flattened, and the amplitude of the T wave diminishes. Cardiac output at rest is unaffected by age. Maximum cardiac output and aerobic capacity are reduced with age. Stroke volume is changed little by aging; at rest in healthy individuals, there may even be a slight increase. As we age, one of the most notable changes in the cardiac system is the decline in maximal heart rate. Therefore whereas a young adult of 20 can be expected to have a maximal heart rate of 200 bpm (beats per minute), in a 70 year old this will be only 150 bpm, in an 80 year old 140bpm and in a 90 year old 130 bpm. The reduction in maximal heart rate is thought to be due to changes in the autonomic nervous system, along with age-related decrease in the number of cells in the sinoatrial node. These result in the heart and blood vessels being stiffer and less compliant, and this, in turn, leads to increased blood pressure; it is noticeable that the majority of patients who 70 years of age or older are likely to be taking antihypertensive medication. 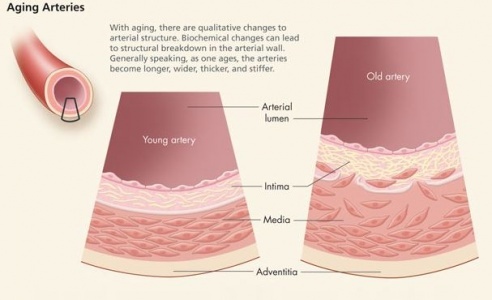 The thickening of the basement membrane of the capillary walls means that the delivery of oxygen and nutrients is slower than in younger people, although there is some evidence to suggest that this effect is modifiable with high levels of exercise. This contributes to slowing of heart rate, lower VO2max and results in a reduction in the aerobic workload possible. Despite the fact that maximum heart rate and aerobic capacity are reduced, exercise in healthy older adults has been demonstrated in many studies to be effective in improving cardiac function and increasing aerobic capacity. The further reading section of the page on Physical Activity and Older Adults has links to some useful resources.